It had never been done before in American politics, much less in Montana. A no-name who's not originally from the state, with no political backing, no war chest, no years of campaigning and building relationships, and no political capital going against one of the most powerful, influential, well-conneted, well-funded, decades-in-themaking legislators in the state and coming 33 votes away from win… ning the state Senate seat - that had never been done before. And Dr. Roberts did it with the 90 Day Race. you can spend years, even decades, struggling and grinding along trying to: - Earn a Massive Income -Build a Massive Business - Accopmlish a Massive Dream - Achieve Massive Attrativeness ...and never get there. Or you can do the patent-pending 90 Day Race and do more to become a millionaire, start your business, become an entrepreneur, lose weight, or attain any goal than years of consistent effort and struggle. 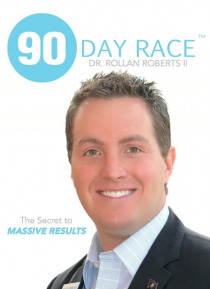 Magic happens during the 90 Day Race, and this thrilling read can be the beginning to your Massive Results!